I love the VInce Camuto Ruched V-Neck Top they are fitted and shapely. I like to wear fitted when I wear boyfriend jeans. Also adding a belt and his sizes and shapes you well on the waste. I love cardigans! Pretty hard to find sometimes especially with quality fabric. I like to make sure that I find cardigans that don't stretch and the elbow and Chynna leave him that stretchiness I'm kind of take that the sweater out of place. Since I am a 5'3, I have to becareful with the length. Some cardigans can be too long if it's a long cardigan. This specific style, hits my calf which is a perfect length for my height. 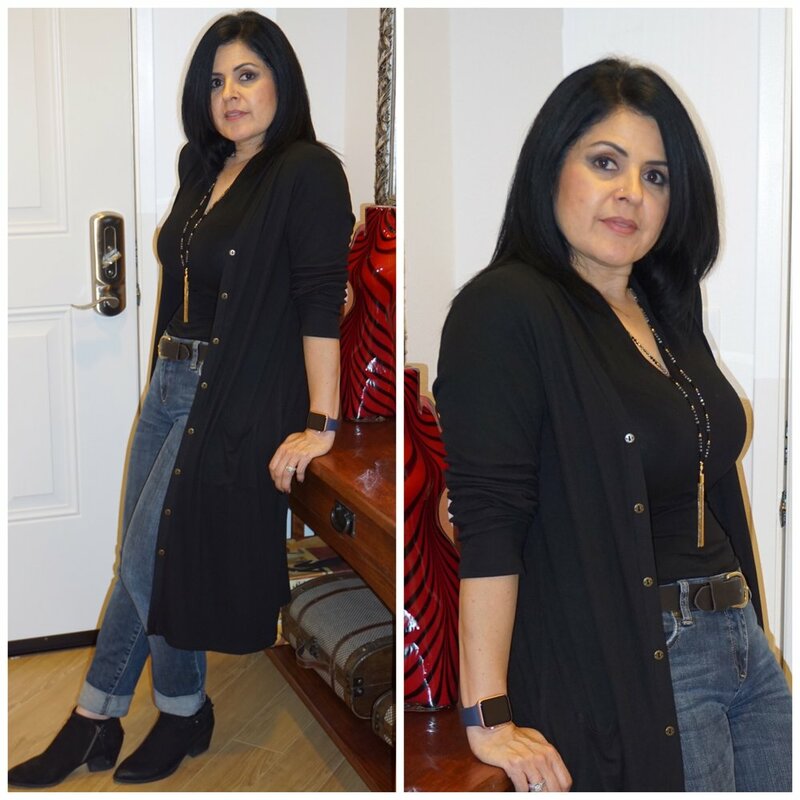 Hms Productions Cable & Gauge Long Knit Cardigan, black is available at T.J. Maxx or last call. T.J. Maxx sells them for $24.99 and last call has them for I believe $48. Dolce Vita Sierra Bootie is available at Nordstrom. I checked on the website today and the price is $119 with an additional 25% off today. Dolce Vita is a great quality! The comfort is amazing! Price is great as well. I have seen Dolce Vita at Nordstrom, Macys, TJMaxx and Nordstrom Rack. This specific bootie in the picture is available at Nordstrom. I am very particular with jeans. With my shape it very hard to find the perfect pair. There are about five different styles that fitmy body type. My favorite are KUT jeans. they come in different styles. The jeans in the picture are Kut from the Kloth Catherine boyfriend jeans and are available at Nordstrom, Macys and Nordstrom Rack. Nordstrom is usually priced at $79-$89 and occaionally on sale. Macys is having a sale with an additional 15% off. At Nordstrom Rack, you can find them on sale as low as $39. These jeans are wonderful for the curvy. I really like the way they shape me and I have to say they fit like a glove. I own 15-20 pairs myself. When I find the perfect pair, I will stock up and different colors and styles.